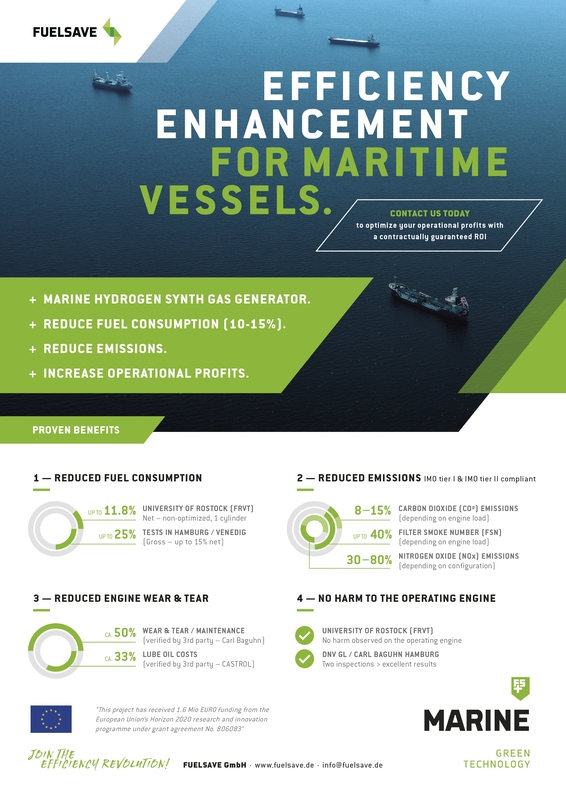 The company’s breakthrough unit, called FS MARINE+ is an engine efficiency enhancement solution, with an onboard hydrogen syngas generator, which combines different processes of gas and liquid water methanol injection to significantly improve combustion efficiency, reduce fuel consumption and cut emissions. It can be retrofitted on any vessel, achieves compliance with IMO tier I and II for older ships and is the world`s first solution that has been approved by DNV GL. The economical & ecological benefits of FS MARINE+ were demonstrated in a 2,5-year proof-of-concept trial on board of one of Europes largest heavy-lift crane vessels. There were no negative effects on engine operation, but rather engine health improved due to cleaner combustion, better lube oil quality and smoother engine run with less vibrations. of Excellence by the EU commission under the H2020 program in 2017. FUELSAVE GmbH and is receiving subsequent funding of 1,6 Mio Euro from the EU commission for further R&D for FS MARINE+ and stipulating deployment of such high-potential / high-impact and unique cleantech solution for the shipping industry with the overall potential to reduce 49.65 million tonnes of CO2-equivalent (Co2, NoX, etc.) per year globally, which represents 5.3% of 2017 global emissions respectively. The excellent test results of FS MARINE+ were verified through independent analysis and reports from engine service and maintenance companies as well as from a university testing institute and has received reviews & approvals from relevant certification and approval authorities. FS MARINE+ has proven itself as a unique solution for emission reduction, with an outstanding and market-leading Return-On-Investment (ROI) and short amortization of 3 years within the warranty period of 15 years maximum, to help ship operators become more profitable, more sustainable and reducing the impact on the environment for a unique win-win.